For many SMBs, limited IT resources and budgets are the norm. This makes keeping pace with technology requirements an uphill battle. Provide access to software, server, storage and other computing resources that you provision—and users access—over the Internet or a private network via browser, so you don’t need to deal with client upgrades. Store data resources in the cloud instead of on individual devices, easing management and security concerns. Typically take a layered security approach, which includes encryption, key management, strong access controls, and security intelligence to further increase data security. This translates into big advantages for businesses. For instance, one of the biggest benefits cloud solutions provide is on the mobile front. Users can easily self-provision and use cloud applications from a web browser, through Apple and Android mobile devices, or Windows, Mac or Linux desktop platforms—without expensive, complex VPN and remote access software. This makes it easier for businesses to support BYOD (Bring Your Own Device) programs. These kinds of benefits have convinced many SMBs to adopt cloud solutions in areas such as CRM and collaboration. As they realize benefits in these areas, they are increasingly likely to consider the cloud for core business functions, such as accounting, financials, and ERP. 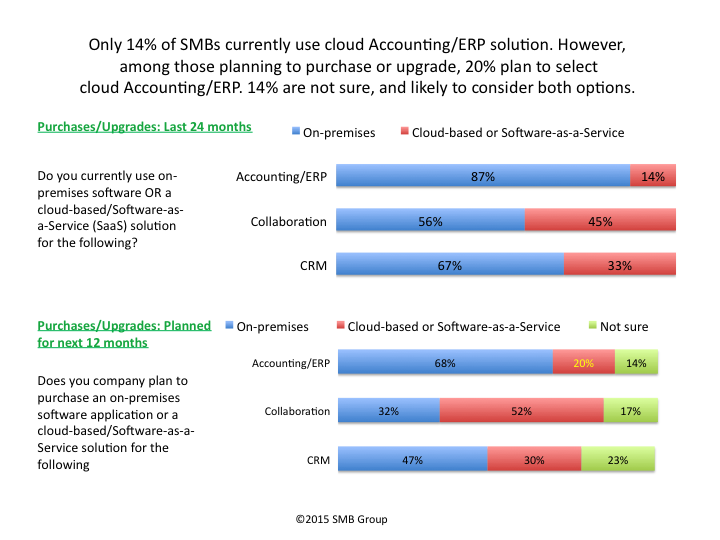 As indicated on Figure 1, only 14% of SMBs currently use cloud Accounting/ERP solution. 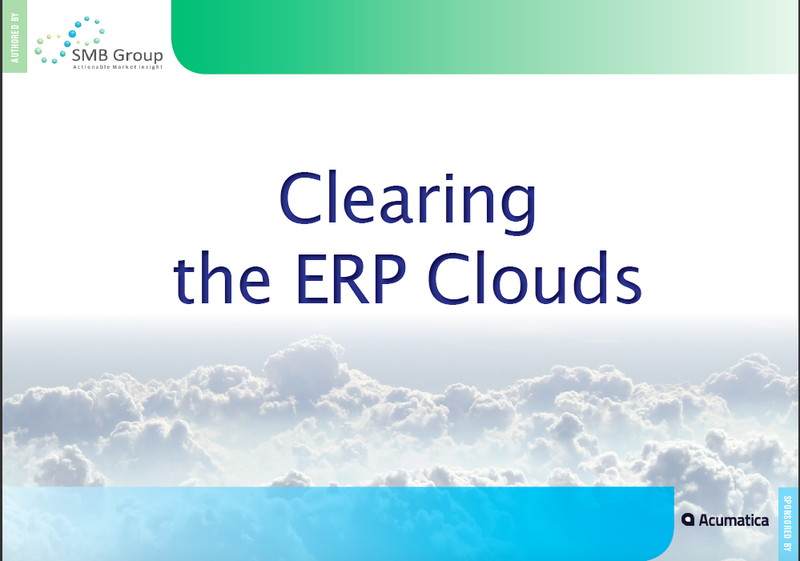 However, among those planning to purchase or upgrade, 20% plan to select cloud Accounting/ERP. 14% are not sure, and likely to consider both options. However, clouds come in different shapes and sizes, including public (software-as-a-service or SaaS) private clouds and hybrid clouds. Adding to the confusion, the lines between different cloud models are blurring. Finally, the list of vendors offering cloud financials and ERP solutions for SMBs is growing. 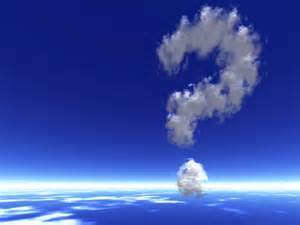 So how can you determine which cloud ERP approach is right for your business? . Sponsored by Acumatica, SMB Group’s free ebook, Clearing the SMB Clouds will help you understand the cloud variants that you’re most likely to encounter when evaluating ERP solutions and deployment alternatives, the tradeoffs between them, and critical security questions. The ebook provides guidance to help you determine which model will best match your company’s strategy, workloads, performance and security needs, and how to assess cloud ERP providers, partners, and solution capabilities. The bottom line is that the business models, goals and requirements of SMBs are as diverse as the cloud ERP choices available–there is no “one size fits all” cloud ERP choice that’s right for all SMBs. While cloud ERP solutions offer SMBs the means to streamline operations, adapt, and grow in today’s fast-paced business environment, it’s important to do your homework to figure out which solution will be the best fit for your business. Thanks for reading and recommending!